These different attitudes towards the approaching winter season are not, however, mutually exclusive. 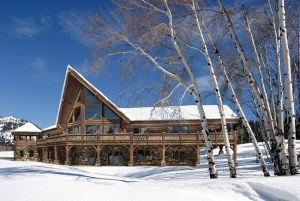 The right custom designed and built winter retreat will satisfy your every need—and desire. Did you miss the first article about our resort namesakes? Click here. The Breckenridge conceptual plan received inspiration from its namesake resort town in Colorado. Like Telluride, Breckenridge is a former Victorian-era mining town. 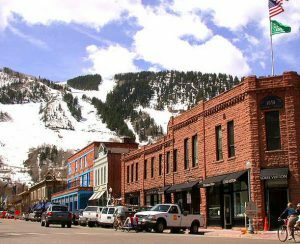 It was founded before Telluride however, with prospectors in search of their fortunes first entering what is known today as Summit County, in 1859. Though Breckenridge lacks the rather colorful past of Telluride, it is no less rich in history. And, part of its charm, is the juxtaposition of new and old, of modern amenities combined with historic log and clapboard buildings. Our Breckenridge concept offers a similar connection. 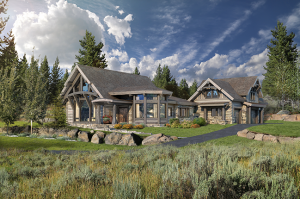 The exterior of the Breckenridge concept beckons with a modern twist, mixing stone, vertical siding, and metal. Yet, its interior also features a stunning timber frame just like days of yore. Interior spaces naturally flow outside to an expansive deck, providing plenty of room for guests and family alike. Entertaining is easy in the Breckenridge due to its large great room, downstairs recreation room, bonus room over the garage, and ample deck space. Because the Breckenridge was designed with a focus on the view, its layout easily follows the slope of a mountainside. By smoothly melding metals and modern angles with the rustic lure of a timber frame, this design concept, quite simply, satisfies. See details about the Breckenridge here. Now one resort, the two mountains of Whistler and Blackcomb were once bitter rivals. Whistler officially opened in 1966 with Blackcomb’s first run occurring 14 years later. The competition between the two mountains was immediate and endured throughout the 1980s with the resorts carrying-out significant upgrades in response to each other. The result of this fierce back-and-forth was spectacular facilities including runs, lifts, gondolas, and, of course, restaurants and shops. In 1997[i], the developer that owned Blackcomb purchased Whistler’s corporation. The marriage between the two destinations, known today as Whistler-Blackcomb, receives over two million visitors per year. Blackcomb however, is viewed by some ski and snowboard enthusiasts as the more advanced mountain of the two (Powderhounds.com, n.d.). And it is Blackcomb Mountain that inspired our Blackcomb concept. The Blackcomb design concept features a delightful pair of octagonal rooms. Instantly memorable with its mixture of angles, roof lines, and wood building materials, the Blackcomb design concept also features a delightful pair of octagonal rooms. As with its mountain namesake, views are paramount in the Blackcomb design concept. Both eight-sided rooms present the outdoors through five, large, jewel-like panes of glass. Most Blackcomb owners retain the formal dining area and secluded den from the initial concept. However, the design frequently receives extensive client customizations. This is because our in-house team of architectural designers is known for its ability to blend materials in new and architecturally creative ways. Read more about our award winning design team here. See Blackcomb’s conceptual floor plan, elevations, and more, here. It is not a coincidence that one of our classic floor plan concepts shares its name with one of the original North American winter destinations– Aspen. Founded by the iconic philanthropist, Walter Paepcke,[ii] in 1946, the Aspen Skiing Company built the first chairlift to the top of the mountain during that same year. And, though the elevation of Aspen Mountain is not notably high relative to other Colorado peaks, it makes its presence felt by its proximity as it majestically surveys the community of Aspen. 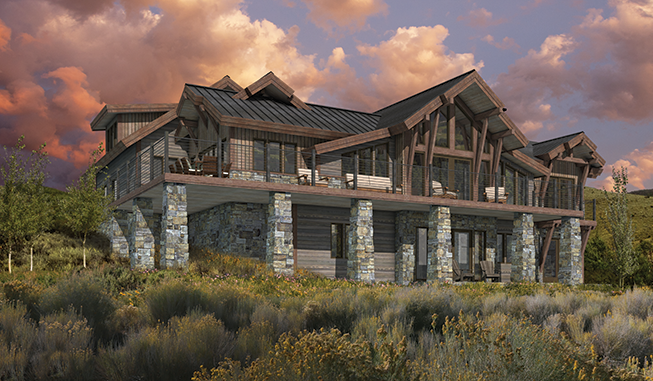 It has been said that our Aspen Peak design concept offers a similar feel upon first sight as that of Aspen Mountain. The Aspen Peak conceptual floor plan, just like its inspiration, is not the largest of our concepts nor is it the most recent. However, it too appears to survey the land with a powerfully serene presence. Aspen Peak is a perfect example of getting it right the first time. Aspen Peak is a perfect example of getting it right the first time. This home’s central peaked great room divides public spaces from private ones with the kitchen and dining area to one side and the master suite and office on the other. Located in the walk-out basement are three additional bedrooms and a large, open recreation room with a cozy fireplace. Outdoor living space is incorporated into the design through a massive glass prow. In addition, a generous deck wraps around three-quarters of the residence. With patio space below the deck and a gazebo attached to the same, it is no wonder so many Aspen Peak owners opt for a hot tub. See Aspen Peak’s classic lines here. As you browse these winter beauties, you likely noticed client customizations for many of the design concepts. PrecisionCraft started building timber and log homes nearly 30 years ago. And, over time, one thing remains true—each project is unique. If you are contemplating a log or timber luxury winter retreat, ski chalet, or mountain cabin, there is more than one approach to the design customization process. Thank you for visiting our Log & Timber Home Blog. Please return in two weeks for the final article in our Resort Inspired Winter Retreats series. [i] Some sources indicate this merger occurred in 1996. Others claim it fully completed in 2003. [ii] Paepcke, an American industrialist, made his fortune with Container Corporation of America. In addition to his Aspen ski venture, he founded the Aspen Institute and the Aspen Music Festival and School.